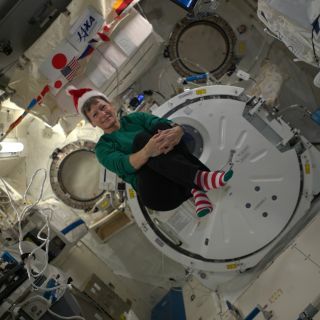 NASA astronaut Peggy Whitson dons a Santa hat and Christmas socks in weightlessness to celebrate the holidays on the International Space Station on Dec. 22, 2016. Astronauts Peggy Whitson, Shane Kimbrough and Thomas Pesquet discuss Christmas on the International Space Station. Today, astronauts on the International Space Station will celebrate the day in many of the same ways that people on Earth celebrate the holiday — relaxing, talking to friends and family, and sharing a special meal. But they do it all while weightlessly floating inside a laboratory that's whizzing around the Earth at 17,500 mph (28,000 kilometers/hour). Astronauts at the space station even have gifts from home to open this morning. The gifts were sent to space earlier this month inside a Japanese cargo supply ship. Because the spacecraft goes around the Earth every 92 minutes, its occupants will see about 15 sunrises throughout the day. That's 15 Christmas mornings in less than 24 hours! As is tradition, the astronauts sent Christmas wishes down from space this week in preparation for the worldwide holiday. On Tuesday (Dec. 20), NASA shared a video in which three of the six crewmembers aboard the station talked about what the holiday means to them — and what's on the dinner menu, of course. French astronaut Thomas Pesquet rocks a classic Santa hat in the video. In that weightless environment, though, his hat takes on the pointy shape of one you'd find on an elf or a lawn gnome. At least it didn't float away from his head. Kudos to Pesquet for sporting his Christmas spirit! Astronauts aboard the International Space Station show off their Christmas dinner. NASA astronaut Peggy Whitson sends a package of dehydrated mashed potatoes floating in microgravity while holding packets of cider and hot cocoa. NASA astronaut and ISS commander Shane Kimbrough holds packages with turkey, fruit salad, green beans and potatoes. French astronaut Thomas Pesquet looks on in a weightless Santa hat. Besides the traditional American holiday fare, Pesquet has some "French delicacies" to share with his crewmates: chicken supreme with morels and ox tongue, for example. From the subtle looks on his face, American astronaut and ISS commander Shane Kimbrough seemed a bit skeptical about trying the foreign foods Pesquet discusses in the video. NASA astronaut Peggy Whitson was also in the video. "I think being on board the ISS gives us a slightly different perspective of Christmas," she said. "Obviously friends and family are important to all of us. But besides funny hats there is another very important aspect of being on [the] ISS, and that’s seeing the planet as a whole, and it actually reinforces, I think, that the fact that we should live as one people and strive for peace."